Cabinet has approved new legislation drafted by the Department of Transport, Tourism & Sport which will make it easier to clamp down on troublesome jetskis, motor boats and other vessels if they behave in a reckless manner. The legislation will require all owners of jetskis and fast powered motor boats to register their vessel for the first time, making it easier to identify owners who break the law or behave irresponsibly, while protecting responsible owners. 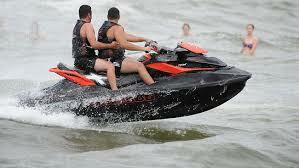 The new laws will require small, fast powered craft like jetskis to register with the Department of Transport. They will then be awarded a certificate of registration and their vessel will be given an identifying mark. Registration will protect safe and responsible users while allowing the authorities to identify, regulate and penalise anyone who breaches safety and environmental regulations. “Powered craft like jetskis and motor boats are great to drive and a lot of fun, but there is also higher potential for accidents. So there is an obligation on their owners to drive safely and responsibly and to consider the needs to other water users, just like car drivers must obey the rules of the road. Offending craft will be prosecuted under existing by-laws, or health and safety legislation, and could face significant fines or possibly bans. The sort of behaviour which can be targeted includes driving in a reckless manner and endangering others, using a vessel where it’s not permitted, or making a lot of noise in a designated quiet area.